Following BBIN’s successful participations at ICE, the world’s most notable gaming exhibition, in 2017 and 2018, the company is marching into London for the third time early next year. Coinciding with the 20th year of BBIN’s establishment as a brand, the company will present its latest integrated services, technical support, and innovative spirit. 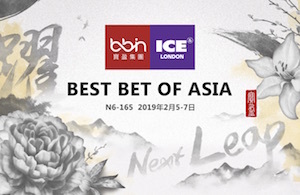 As Asia’s leading software supplier, BBIN continues to demonstrate its core competencies and connects with the world at ICE’s international events. BBIN is looking forward to leading international clients into the Asian market territory. Through international alliances and cooperation, BBIN aims for crucial opportunities and to make a leap to new heights. Having accumulated two decades of professional experience, BBIN holds a high market share and superb customer satisfaction in Asia. The company is familiar with the differences between regional markets and also has access to top resources and grasps the key strengths for success in Asia. This time, BBIN’s stand will continue to incorporate the brand’s iconic elements, including ink wash painting and the color oriental red. In addition, BBIN also features a creative spatial design to present a new image of the East, exquisitely interpreting Chinese culture with a contemporary essence at an event running from February 5-7, 2019, at London ExCel. 5 to Feb. 7. Greentube, the Novomatic Interactive division, is excited to announce its entry into the Colombian market with fully licensed operator Wplay. SciPlay Corporation, the social gaming business of Scientific Games Corporation, has commenced the initial public offering of its Class A common stock. The Golden Nugget clinched four awards at the EGR North America 2019 awards in Atlantic City.